The Model 250 is our largest plant. Capable of processing 250cu yards per hour, it is the definitive machine for large scale mining operations. Featuring premium Eurodrive electric motors, incredibly durable frame construction, a vibrating hopper/grizzly capable of 36″ aggregate, and a high-speed screen trommel that operates at 45rpm. The Model 250 thoroughly and completely processes large volumes of material like no other machine, with entirely unmatched gold recovery. 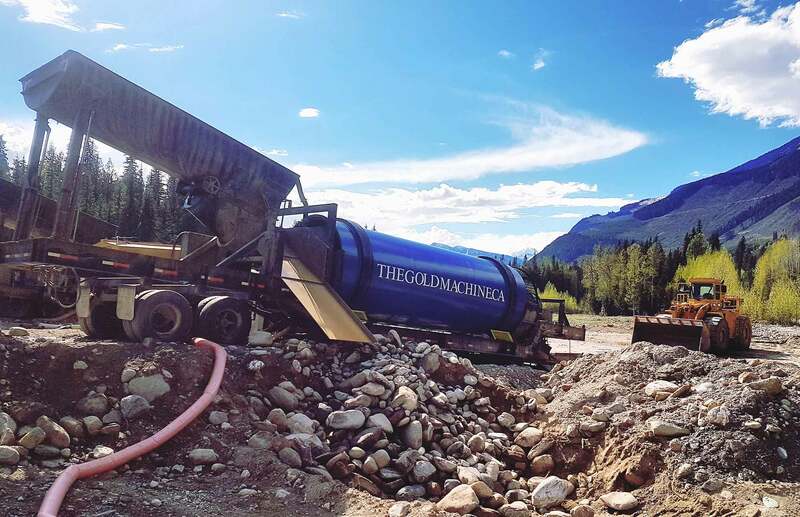 All of these features, combined with the portability of it’s built-in 53′ long, tridem-axle trailer system, make the Model 250 the very best in placer gold recovery on a large scale. 400-600 Series excavator or 5 to 7 cu. yard Wheel loader. 65 kw John Deere generator with 30 hp and 15 hp SEW electric drive motors, 2 hp vibrating scalping grizzly, 36″ wide tailings conveyor and all sluices and matting. This machine is complete and ready to mine.